A vogue arose in Edo Japan -- the love suicide. Of this, the playwright Chikamatsu Monzaemon (1653-1725) is both chronicler and -- such was the power of his drama -- instigator. His puppet plays, like Saikaku's stories, were based on actual incidents. The one that inspired his "Love Suicides at Sonezaki" had occurred only a month before the play was first staged in 1703. 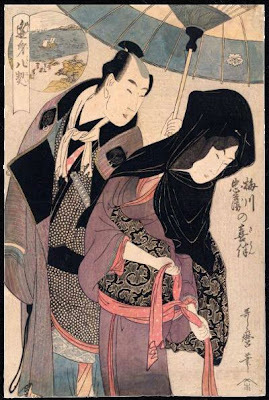 The Osaka soy-sauce merchant Tokubei and the courtesan Ohatsu are deeply in love, but it is hopeless; she is under contract to her bordello, and Tokubei lacks the money to ransom her. There is only one solution: death. "Did our promises of love," sobs Ohatsu, "hold only for this world?" The pair flee in the dead of night to the Sonezaki Forest outside Osaka: "Farewell to this world, and to the night farewell." "They embrace, flesh to flesh," chants the narrator, "then fall to the ground and weep -- how pitiful they are! Their strings of tears unite like entwining branches . . . a symbol of eternal love. Here the dew of their unhappy lives will at last settle." as fascinated as the kabuki-going public was with the telling of these tragedies, none moreso than utamaro kitagawa, artist, printmaker, and storyteller by woodblock. for the first time, these stories have been told, along with many more; one reading and these are not images on a page but are reflections of lives lived, and of lives ended. utamaro revealed, by gina collia-suzuki, explores all of the artist's themes, subjects, and motifs, and does so in such a way as to genuinely, as the title says, reveal. her voice is clear and certain, and her re-telling of the artist's inspirations are wonderfully interesting and easy to read. we are reading, in this book, her lifetime work, along with that of jack hillier and others; it is carefully researched, and collia-suzuki brings us full translations of titles, poems, and contents. we also learn where in the yoshiwara (the pleasure district) each woman lived. above and beyond the topic of suicide are many other bits of information about the lives of these people we see in the prints that we might not want to read. 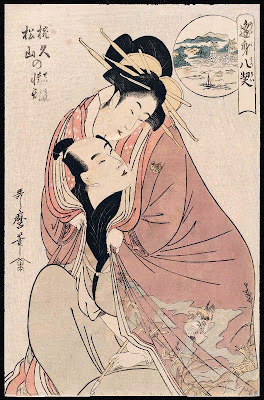 illumination by its nature destroys illusion, and much of what utamaro's prints did was create illusion. collia-suzuki responds: I confronted the reality and harshness of Utamaro's time a long time ago, when I was just a teenager. I had an interest in history in general, and the entire globe seemed to be equally harsh to me. Prostitutes may not have been under contract for ten years in Western brothels, but for the most part they were no more free to choose a different life, if they wanted to survive, than the women who were enslaved within the Yoshiwara. There was a time, early on, when I questioned the artists' desire to portray these women as princesses in all their finery, considering the reality of the situation, but the artists who depicted them were governed by laws which made it impossible to portray the realities of everyday life -- the authorities didn't approve of social comment... they didn't approve of a lot of things, as is evidenced by Utamaro being censored at the end of his life. I do think it's important for us to present an accurate image of life at the time now though, although I realise that when we do that we risk alienating the audience. I think that if we try to gloss over the hardship, we do a disservice to the women in the prints. gina on work: when I was researching the Chinese legends behind Utamaro's prints, I was reading up on Guan Yu, Zhang Fei, and Liu Bei and the oath taken in the peach orchard. I started reading the relevant section from Romance of the Three Kingdoms, but then couldn't stop because it was so inter- esting... and we're talking about a book with 120 chapters. I could just keep going off at a tangent and I'd get nothing done if I didn't force myself to get back to whatever I was doing originally. when I first started researching the pairs of lovers, [learning] that the people actually existed and often met such tragic ends [was surprising]. In particular, it would have to be finding out about Bunshichi... a man who was responsible for some very violent assaults and was executed for them in 1702. It was surprising to discover that, far from being the chivalrous hero he was portrayed to be, he was a very nasty piece of work. Discovering the true stories behind the theatrical adaptations of them really makes you view the prints differently... in some cases more sympathetically, in others quite the opposite.